An excellent review if the Israeli experience for the last 20 years in growing olives under adverse conditions. Forward-looking with regard to technology and innovative approaches. 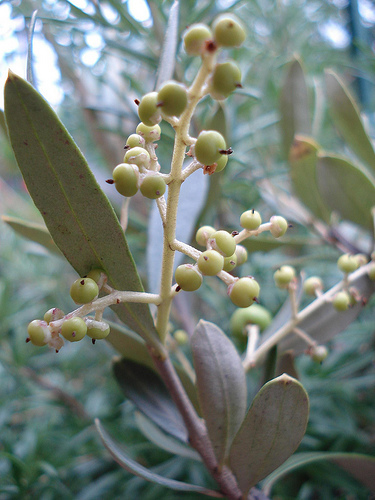 A valuable reference for anyone considering olive cultivation under marginal or adverse conditions. Dimitrius Boskou Ed., AOCS Publishing. An excellent review of olive oil technology. The chapters on "Olive Oil Composition" and "Analysis and Authentication" are extensive, detailed and well referenced. A valuable reference for anyone struggling with the problems of olive oil adulteration. This is more of a nurseryman's reference, which is not surprising since the author is Professor of Pomology. Heavy emphasis on propagation, planting, irrigation and nutrition. Concice descriptions of all of the major olive varietals. Lots of current references on the areas not thougherly covered. An excellent overview for anyone just entering the Olive Oil arena. Clearly written and well illustrated with photographs and graphs. Somewhat dated in the areas of olive oil analysis and authentication as these areas have advanced very rapidly in the last 12 years. An ambitious approach to an important and difficult area. Boskou tackles the tricky subject of trying to evaluate the effects on human health of the phenolics, sterols, triterpenes and hydrocarbons in olive oil. Well thought-out and very current this is a valuable reference for anyone trying to evaluate the beneficial effects of olive oil. International Olive Oil Council, Madrid, Spain, English, 1st Ed. 1996. A well written and beautifully illustrated volume, it is an excellent introduction to olive cultivation and processing world-wide. Due to the tremendous technical advances of the last 14 years, the technical portions of the book are out of date.